I watched The Lego Movie once again. Like the first time, I cried like a little kid. It's a good movie, but the strong emotional reaction came from deep inside, firing the same childhood memories that The Lego Memory Lane—Leg0 HQ's underground secret vault with all their sets—did when I visited it in Billund, Denmark. In Billund, everything is awesome. I was there back in June 2008 during an exclusive tour of the factory and it's a magical wonderland. I saw how bricks and minifigs are made. How they store them in a giant 65-foot-high Lego cathedral controlled by robots—which seems out of Willy Wonka. Then I visited their museum house—the original family home of the company founder—which has some of the best and most famous Lego sets in history on display. I have to confess that life hasn't been very good lately. Work around the clock, not enough free time, trying to have kids and crashing badly... all while moving to a country I don't particularly like, away from my best friends and family. Maybe that's why visiting Lego's Memory Lane-the secret vault guarding almost every Lego set ever manufactured-touched me in a way I didn't expect. This wasn't amazement or simple awe. I was already astonished to no end by the tour of the Lego factory. No, this was something else, something bigger than the impressive view of the 4,720 Lego sets inside this lair. These weren't just simple boxes full of bricks. These were tickets to ride a time portal to emotions and simpler days long forgotten. I didn't know that when I was curiously ogling the oldest sets, from the 1950s. Jette Orduna-the curator for the Idea House, Lego's history museum set in the old family house of the owner, Kjeld Kirk Kristiansen—was explaining the first Lego sets, obviously enjoying my enthusiasm. "Here's the wooden box that some shops around Denmark had, usually hairdressers or general stores" she would say while carefully opening it for me to see its contents, simple red and white bricks without tubes, some of them with windows on them, "they contained individual Lego bricks. 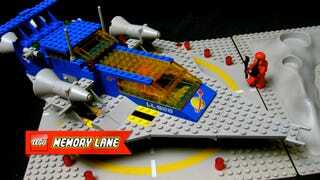 Back then, parents bought them regularly to their children, so they could keep expanding their Lego system." Then she would turn her attention to another set, as I kept asking what was this or that. "Yes, it's called 'electronic' because this train could be activated by whistling," she would explain, whistling herself. I was just enjoying it like an archeologist. Her explanations, the cool box designs, the quick evolution of the first years... I was amazed by the ingenuity of it all, curious about the origins of the myth. But that was it. Just simple curiosity. Until we got to the 1970s. Knowing my previous comments, Jette went straight to one of the shelves, at the end of the long aisle. She looked up and down, her lips pressed together, concentrated in finding something. While she was doing this I was filming around, eyes wide open, thinking "oh, is that?" and "nah, that can't be... can it?" my excitement growing by the second. It was then when she took out a large rectangular box with yellow sides, saying "a-ha! Here it is." I turned around and I saw what she had in her hands: the Lego Space Galaxy Explorer. And then it hit me. Lift off. Godspeed. Boom. A wave of emotions took control, hitting my head like a Lego Airbus 380. Dozens of images started to appear in my head, Polaroids of Xmas and birthdays that I thought were faded, completely fresh, color-corrected, and restored by the damn Lucasfilm for a Blu-ray re-release. I could even see the Hollywood quote whores saying "Better than ever! ", "The past never looked so good! ", and "Five stars!" embossed in silver on the special edition boxed set. There was my mother and father-who built a huge Lego ferris wheel and the Blue Train for us when we were too young to build it, then never stop giving us new sets every year-and then my two brothers and my sister, playing on the rug, building all kind of new and wonderful constructions populated by the strangest creatures. And that smell. The perfect smell of Lego bricks. You know what I'm talking about, those were the days and all that jazz. But for real. Feelings and moments from times when everything was innocent and your only concern was your bike, a big carpet full of Lego bricks, and the amount of cocoa in your cereals. After that, it was one wave after the other, jumping from Lego Space to Lego Technic to Lego Town to Lego Castle and Lego Pirates and Lego Star Wars. Each set a memory, a particular Kodak moment blurred by the occasional teary eye. Soon, too soon, it was over. And as I was walking up the stairs, back to the present, slowly letting the past fade back into the treasure chest, I thought: "This must be it. This must be reason why Lego is so loved by almost everyone in the planet." Sure they are fun. The details, the incredible designs, the way you physically touch them, how they make you use both your hands, creativity, and logic. All that is there, all are parts of their universal appeal. But there's a lot more. Something more fundamental, bigger than the sum of all those qualities. Underneath all that there's a primal connection, something that makes everyone tune into the childhoods when they see the bricks, and get back into brighter, careless moments, even at the subconscious levels. And thinking that, I joined Jette and Jan in the Real World, with a grin on my face. Life wasn't that bad, after all. Not if something as simple as a colored brick can make me smile again. I couldn't think of a better song to go with this story than the Johnny Cash version of Memories Are Made of This, from the album Unchained. Sadness and happiness at the same time, bringing so many other memories on its own. You can buy it at Amazon or the iTunes Music Store. 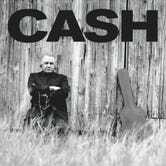 In fact, get the whole album while you are it, because it's amazing (and so are the rest of the American Recordings series). You can watch The Lego Movie online on iTunes or Amazon.